Just as a disclaimer, no one paid me to write this and I am sharing based on my own personal opinion. I did receive some food items for free (when mentioned), but that in no way influenced my article (in fact, if I didn't like the sample, I didn't include it in the post! So there). I am an Amazon affiliate, and any Amazon links used will be stated in the post. I am a fan of the whole Dang line (ha! See what I did there?). I love their coconut chips (they were included in my 9 Exciting Snacks to Liven Up Your Lunchbox post) and their onion chips are delicious, too. But the rice chips are little different than their other line of coconut and onion chips. I bought the sriracha flavor (which are really spicy- but I love sriracha), and they're kind of like a mini rice cake. They come in a variety of other flavors, so don't worry if your kid is not a fan of spicy things. You can find them through my Amazon affiliate link here. The brownies and blondies from Rule Breaker snacks come in a perfect little square package (lunch box size!). Gluten free, vegan, and they contain no dairy, eggs, soy or nuts! They're also chock full o' great ingredients like chick peas, flax and gluten free oats. If you're looking for a tasty treat that's also high in protein and fiber, then give 'em a try! Plus, they're locally made in Brooklyn, New York. Lo and behold, you can find these through my Amazon affiliate links, too. Check them out here! I see a chick pea trend in my suggestions, and honestly, I didn't plan it that way! I guess chickpeas just have a natural way of fitting in. Anyway, these chickpea treats from The Organic Bean are always a hit around here because they're crunchy and salty and kind of fun to eat. One thing to beware of, though, if you're packing anything chickpea in a lunch box: chickpeas are part of the legume family, which some kids can't eat if they're allergic to certain types of nuts (which is why they often clarify this in schools, i.e., little Johnny has a tree nut allergy, as opposed to a peanut allergy). Find them through my Amazon affiliate link here. I'm a sucker for things like this. I'm way worse than my kid when I see a Star Wars themed snack or a new snack featuring a favorite movie or character. But honestly, I was pleasantly surprised by the flavor of these. I like Pop Chips as it is, but in these odd shapes, they almost reminded me of a different chip all together. It was also fun to find the 'mystery shape' inside (I won't tell you what it is). 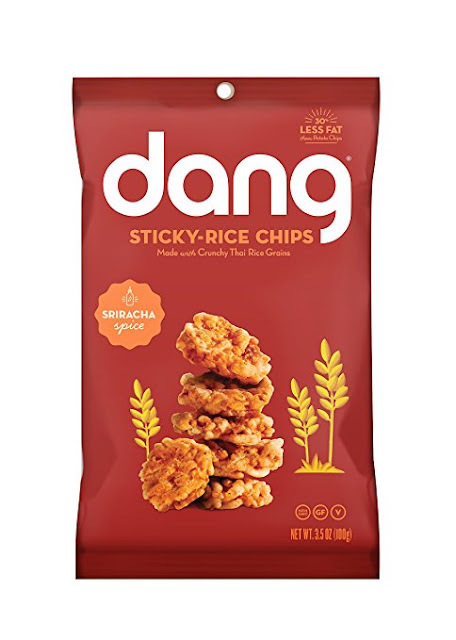 They say these are a better choice as opposed to regular potato chips, since they're not fried.Plus, no cholesterol, no artificial flavors and no added preservatives sound like a pretty good idea to me. These are a limited edition in the Pop Chips line, but they do sell them in a bulk size on Amazon. You can buy them through my affiliate link here. I love Stroopwafels! What store do you find them in near you? The Fairway markets have them or you can order them directly through the MyWaffleWaffle site. I should probably add that info to the post! I need to get those Pop Chips! My son loves all things BB8.